Hello friends, feast your eyes on this beautiful beast of a shawl! Gorgeous right?! And huge right!? I love it so much in all it's gigantic brioche glory. I should qualify all this talk of gigantism by saying that I am a smidge taller than 5'2" and I am an expert at knitting quick and easy single skein shawlettes, so to me this is a big shawl, but if you're accustomed to this scale you might not be as impressed by the size as I am. This shawl used the better part of 3 skeins of yarn! Well, not quite actually. The shawl weighs 275g, you can do the math if you like. ;) It's a generous size and is incredibly cozy and cushy and awesome with all that lovely textural brioche and garter stitch. It's good stuff. Before I go on much further, how about a shout out to these ridiculous pants I put on specifically for this photo shoot!? They feel like pyjama pants and look like garbage, but I keep tricking myself into thinking that they are cool and laid back and appropriate for shawl photoshoots but really they are just pyjama pants with an identity crisis. I'll give myself a break for having worn them last year because I had just had a baby, but that excuse is wearing pretty thin. I'll try not to do this to you again I swear! But the shawl is nice right!? Ok, but back to those pants. The reason I put them on for these photos is because I chose the colour palette for this shawl to wear with my favourite spring/fall jacket that is the same colour as the pants, a soft army green. It was way too hot to put on the jacket and I didn't want to hide the shawl under a jacket anyway so I opted for the pants. I know what you're thinking, please stop drawing my attention to those awful pants! Sorry. The colour palette is not my usual blue/grey/turquoise scheme. It's quite a departure for me and yet I really love it. I love that it's warm and soft and that pink on the border just makes me so happy! It really ties the cream/red colour scheme together for me and is a shade that I think really works with the faded green of my jacket. The two lighter skeins are early speckled/flecked experiments and though the results are quite subtle, I really love the look. 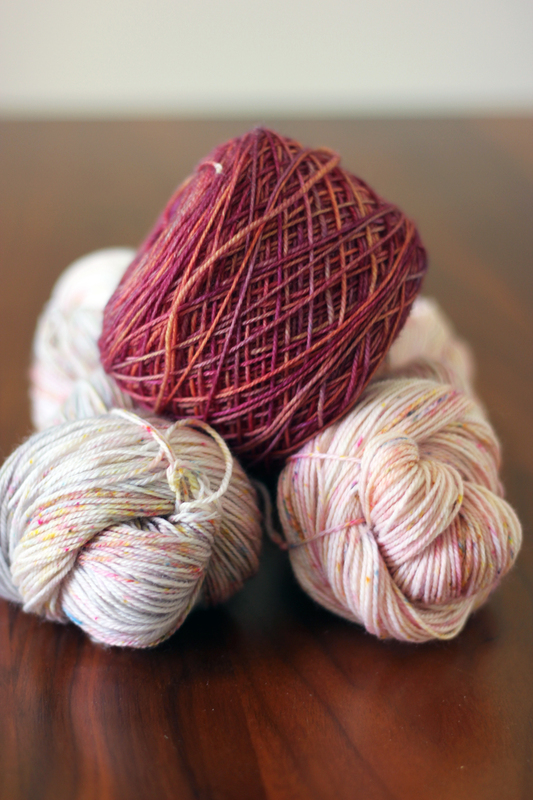 We're still in the process of figuring out what exactly our speckled identity is and right now I'm leaning towards a more subtle/tweed look over the crazy riot of colour so many speckled yarns are known for. I might change my mind tomorrow, so don't hold me to it! The pink shade in particular is really beautiful. It has little flecks of all the colours in the rainbow but much like a tweed yarn it reads as a unified, soft pink yet offers so much interest for the knitter. We're still experimenting with this style, I'll be sure to let you know when we've got more to share! I'd highly recommend the pattern. 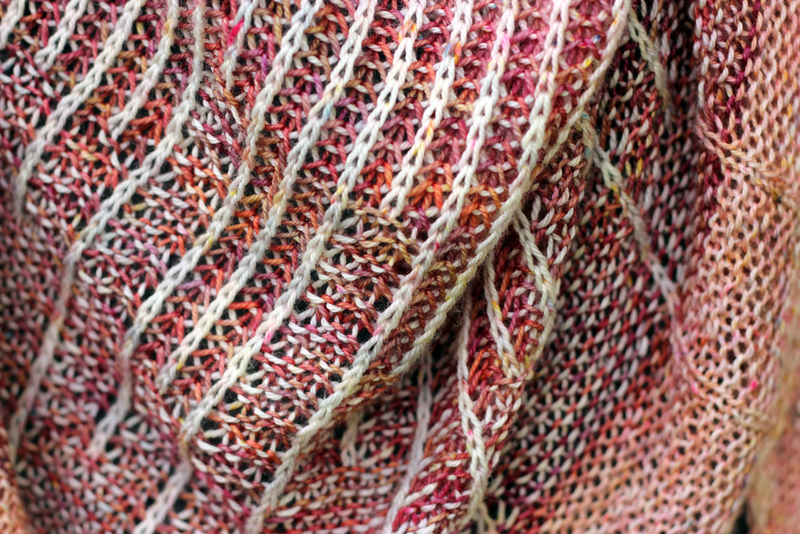 It was my first introduction to Susanne Sommer's patterns and I'm already eyeing more of her shawls since this one was such a great knit. She's got several really nice garter stitch/brioche combos that are all beautiful and offer no end to the colour pairing possibilities. Such fun! Thank goodness for big shawls and naked babies! Hi Rowan!